In high density environments, the gas content of galaxies is stripped, leading to a rapid quenching of their star formation activity. This dramatic environmental effect, which is not related to typical passive evolution, is generally not taken into account in the star formation histories (SFHs) usually assumed to perform spectral energy distribution (SED) fitting of these galaxies, yielding a poor fit of their stellar emission and, consequently, biased estimate of the star formation rate (SFR). In this work, we aim at reproducing this rapid quenching using a truncated delayed SFH that we implemented in the SED fitting code CIGALE. We show that the ratio between the instantaneous SFR and the SFR just before the quenching (rSFR) is well constrained as long as rest-frame UV data are available. This SED modeling is applied to the Herschel Reference Survey (HRS) containing isolated galaxies and sources falling in the dense environment of the Virgo cluster. The latter are Hi-deficient because of ram pressure stripping. We show that the truncated delayed SFH successfully reproduces their SED, while typical SFH assumptions fail. 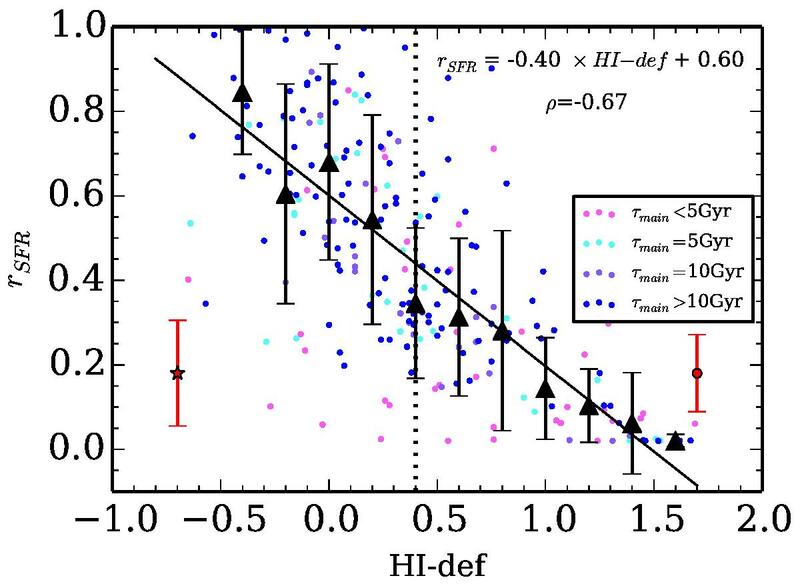 A good correlation is found between rSFR and Hi−def, the parameter that quantifies the gas deficiency of cluster galaxies, meaning that SED fitting results can be used to provide a tentative estimate of the gas deficiency of galaxies for which Hi observations are not available. Relation between rSFR and the Hi deficiency. Data points are color-coded according to the value of τmain obtained from the fit. The mean errors bars for each subsample are provided with the red star for the normal galaxy sample and with the red filled circle for the deficient galaxies. The Spearman correlation coefficient ρ of the relation is indicated. Black triangles are the median values in bins of ΔHi−def= 0.2, and the error bars are the standard deviation of the points in each bins. The black filled line is the best linear fit to the data. The black dotted line indicates the adopted threshold used to separate normal from deficient galaxies. The HRS galaxies are placed on the SFR-M∗ diagram showing that the Hi-deficient sources lie in the quiescent region, thus confirming previous studies. Using the rSFR parameter, we derive the SFR of these sources before quenching and show that they were previously on the main sequence relation. We show that the rSFR parameter is also recovered well for deeply obscured high redshift sources, as well as in the absence of IR data. SED fitting is thus a powerful tool for identifying galaxies that underwent a rapid star formation quenching.